Collaboration requires shared ideas, but also a shared working environment where researchers can gather, listen to each other, and exchange ideas. In order to build a community, an inspiring environment that fosters precisely these opportunities for coming together must be created. The building is ECDF’s melting pot, as it provides numerous occasions for members to meet each other. The ECDF researchers have their co-working space, laboratories, workshops and cooperation rooms here. In the event rooms and showrooms, the results achieved can be presented and researchers can meet at one table. 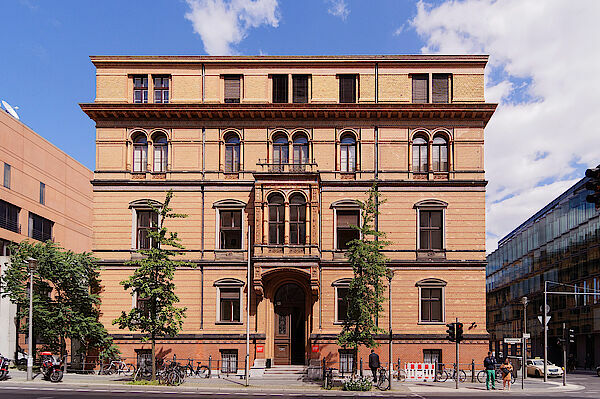 The Robert Koch Forum is also the location of the ECDF office. At the Robert Koch Forum, Charité researcher Robert Koch (1843 – 1910) presented the discovery of the tuberculosis pathogen, for which he was later awarded the Nobel Prize.